“An open presentation by the Sports & Recreation Alliance – take this opportunity to find out just what is happening and how it can affect your sport in the future at the Wisbech race. The presentation will take place at 15:30 on the day of the race. FISS like most of skatings governing bodies has been a member of The Sports & Recreational Alliance for some time but we are the only wheeled skating discipline which has been prepared to engage with them in the voluntary governance program for sporting governing bodies which they have been tasked to run. What this actually means to us and our members at present is probably something of a mystery to our clubs and to our members. Amanda Bennet is the Governance Consultant for the Alliance and is attending the Wisbech race to explain why this issue is so important to our members, our clubs and to us as a sport. The Alliance along with other organisations is also likely to be attending and presenting at our AGM but in order to gain the most benefit from this the FISS board would strongly recommend that all clubs provide at least one representative to attend this Initial brief presentation. All skaters from any skating discipline are most welcome to attend. We recognise that the welfare of all children is paramount and that all children and young people; regardless of ability or culture, have equal rights of protection. We have a duty of care when children and young people are in our charge and we will do everything we can to provide a safe and caring environment whilst they attend our activities. The responsibility of managing eSafety can be both demanding and challenging, and therefore must be appointed at managerial/trustee or committee level to personnel who are available when we are operational. Their role is to oversee and ensure that our eSafety policy is fully implemented. This includes ensuring they and all staff receive eSafety information and child protection training as appropriate. The deputy should be available to support or cover for the nominated lead. S/he will also handle any complaints or allegations against the nominated lead if appropriate. This policy will be made available to all adults, children, young people and parents/carers via the FISS website. www.inlinespeed.co.uk. Why do we need an eSAFETY policy? Recent advances of the internet, mobile phones and other electronic technology has made access to information and communication increasingly easy for everyone. It is estimated that 98% of young people can access the internet away from school and, in addition to research for homework, the majority use social networking sites; along with playing games and downloading music and videos . Recent CEOP (Child Exploitation & Online Protection Centre) research with 6,000 young people aged 11-16 years, demonstrated that 25% had met a new “friend” from the internet for real, 25% of whom had met that person alone, 2% had taken a trusted adult, the remainder had taken a friend of their own age. Government guidance is clear that all organisations working with children, young people, families, parents and carers have responsibilities. It is important to remember that children and young people can also abuse and that such incidents fall into the remit of this policy. What else might BE OF concern ? What do I do if I am concerned? a child being imminent danger, always dial 999 for the police. The Federation of Inline Speed Skating has signed up to the Voluntary Code of Good Governance, an initiative backed by Minister for Sport and the Olympics Hugh Robertson MP. The Code provides a framework for good governance which sports bodies can adopt, making a public commitment to improvement. The Code’s seven principles are based on good practice in leadership and governance, and provide signatories with practical, simple and realistic advice. Thomas Fell, Chairman, believes that the Code will help the Federation of Inline Speed Skating become more effective. “By signing up to the Voluntary Code of Good Governance, Federation of Inline Speed Skating hopes to continue its development and to fully equip itself to meet any future challenges that may lie ahead. “Following its principles will help us build on the successes Federation of Inline Speed Skating has had and continue on the path of good governance”. 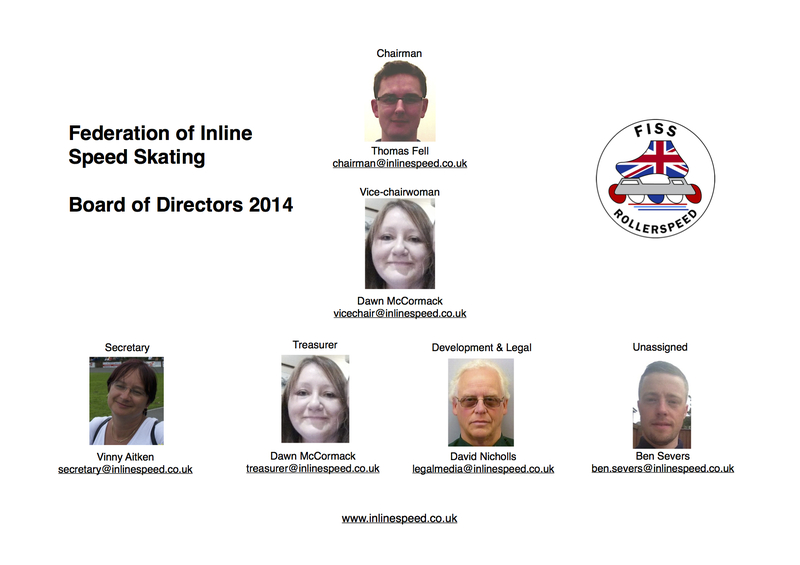 Tim Lamb, CEO of the Sport and Recreation Alliance said: “I’m delighted that Federation of Inline Speed Skating has signed up the Voluntary Code of Good Governance. The Code has been produced by sport for sport and by adhering to its principles the sector can only become stronger as a result. Put simply, organisations with good governance make better decisions and are more effective as a result. Signing up to the Code is an important step on the way.